With the holidays coming up quickly, we know many families are thinking about what kind of gifts to give to their babies. We created this holiday gift idea list to help parents (and grandparents!) choose items that are fun and also help promote their development! 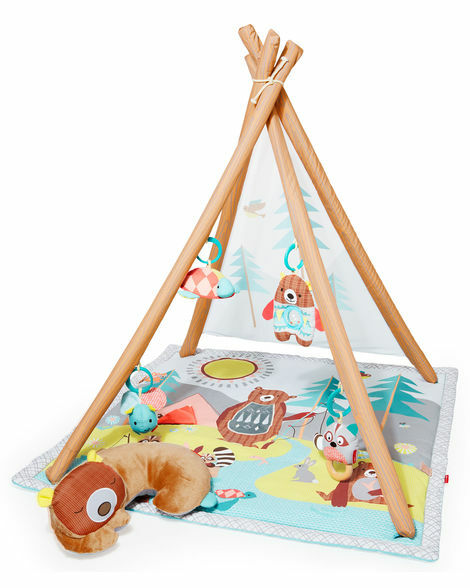 We love this woodland themed play mat by Skip Hop for its sheer adorableness, but there are lots of other great play mats out there too! They provide a great place for baby to play on her back, tummy, side, and sitting up. The hanging toys encourage her to reach up and may provide great sensory feedback like a rattle, chime, crinkle, or light to reward her for reaching them. Some models come with a tummy time pillow that can be used under her chest to make tummy time easier. The surface of the mat may have fun textures, mirrors, and flaps for baby to explore too! 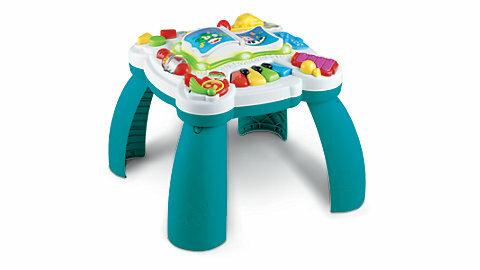 A play table, like the one pictured by Leapfrog, is a toy that will grow with your baby. The legs can be removed to help your baby reach the toys before he can stand. When your little one is sitting up, you can add two legs to provide an angled surface to sit and play at. Once he's getting up on his feet, you can add the other legs back on to encourage him to pull up to play. They seem like a simple toy at first, but they are incredibly versatile! The small size makes it easy for baby to grip from an early age. The various textures are great for exploring with her hands and mouth. They can be linked together to make a rattle or to hang other toys from. 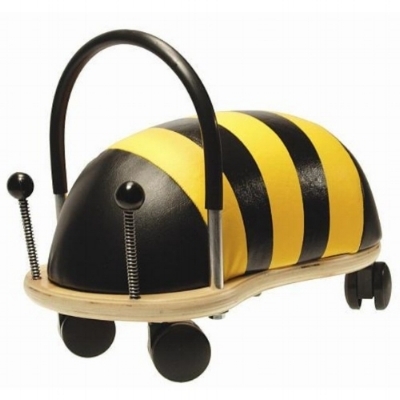 Another seemingly simple yet versatile toy that baby will love. The pieces may be grabbed with one hand or two and encourage him to learn about grasp, release, and in-hand manipulation. Baby will love exploring these toys first by taking them apart, and eventually learning how to put them together, practicing hand-eye coordination. 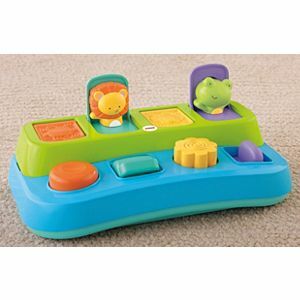 A pop up toy is a great choice for a toy to help baby learn about cause and effect. When she performs the function of pushing, pulling, or twisting a lever, she is rewarded with a fun figure popping up. Learning to master the different levers develops baby's fine motor skills as well as her problem solving skills. 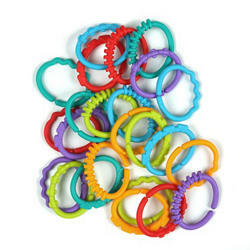 Little ones will love having a container of easy to grip shapes to dump out, grab, and mouth. As he progresses, he will learn how to put the shapes into the bucket. 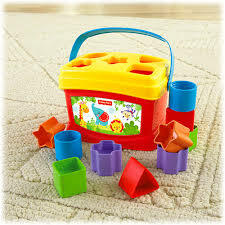 Container play is great for baby's fine motor and cognitive development. I always get excited because once they can put toys in, it means that they can help clean up!! 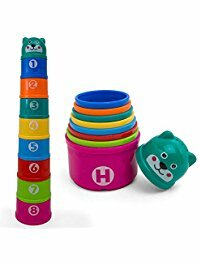 The added challenge of putting the shapes in the correct slots means that this is a toy that will grow with baby, as he problem solves, learns to recognize shapes and colors, and can match and categorize the blocks. Babies love music! 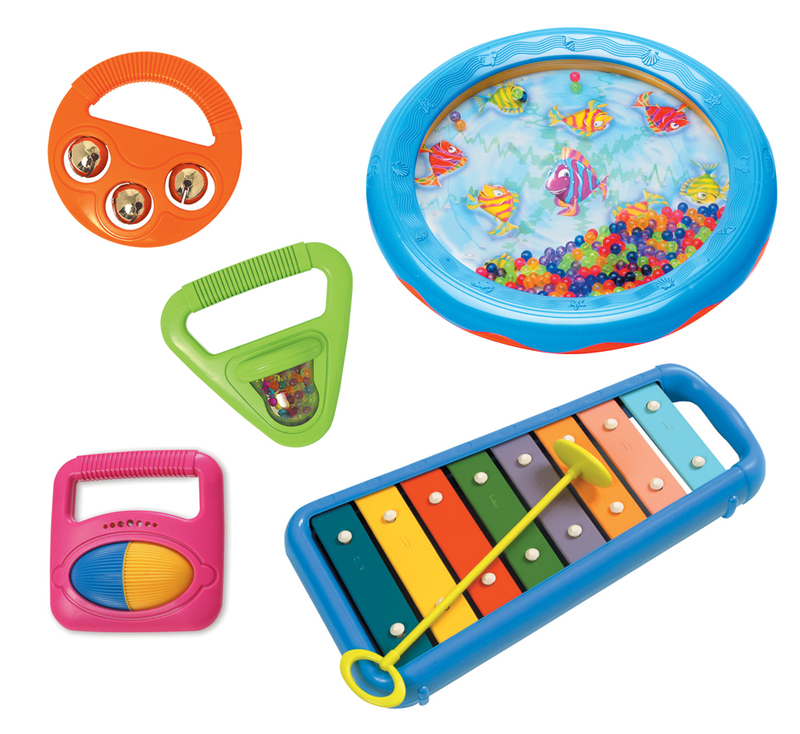 Using the instruments will help her with her motor skills and balance in sitting and standing, even more so when she starts to bounce or sway to the beat. Music is also great for baby's language and cognitive development. Get your baby balls in various sizes and textures to challenge his ability to grab them, using one or two hands, and to explore the various textures. Early on, balls are great for grabbing, holding, and releasing. As he progresses, he will enjoy rolling, throwing, and kicking them. Your older baby will love to go for a ride around the room on a ride on toy, which is great at challenging her balance and stimulating her vestibular system. As she gets bigger and stronger, she will be able to propel it herself which will increase her leg and core strength. A wonderful gift for your little one is an activity or experience such as a parent-baby class that you can do together. Babies On The MOVE classes provide a fun learning opportunity for parents and their babies, and the things that you learn will benefit your baby long after you attend class. You can also check out other local classes including Kindermusik at KinderVillage Music, and Songs for Seeds for more fun experiences with your baby! With the holidays coming up, we know many families are thinking about what kind of gifts to give to their babies. We created this holiday gift idea list to help parents (and grandparents!) choose items that are fun and also help promote their development!